I’ve still yet to see any salvania around the lake. Tons of hydrilla and pads coming up all around. But due to the past years of salvania sinking to the bottom of lake it has put a bad hurting on some areas of lake and now a foot shallower at times. This will in turn clog ur motor and over heat it very easy. Lake is fishing great and plenty to see so y’all enjoy it while we still can. They are spraying certain areas of the lake though just in case of an out break. I don’t guess you’ve been in kitchen’s creek lately. I have not. It’s been bout 3 weeks since I’ve been up there but was lots of hydrilla and pads already. I honestly don’t go up there but once a year just to goof off. Local tournament produced two 27 lb bags yesterday to finish 1st and 2nd. Too bad they went on to bass heaven. That's what I was afraid of.....very poor fish care on a hot day......makes me sick! Congrats on the win....ashame to lose big fish....I think they should cut back to 3 fish weighed.....5 overs in a livewell for extended period of time in this weather is not good. Last edited by mudd; 05/27/18 03:41 PM. 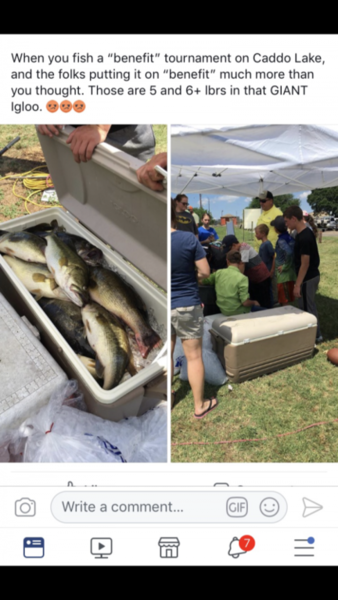 They recently took the slot off one our local lakes here and started telling everyone to keep there limit when it’s caught. The lake is now producing more bags 25-30 then I ever thought was possible so this method does work and will always work. I was told there was two huge coolers full of fish. There’s no way all of those fish died from bad fish care.